Kennis of Itch to Stitch has created the Holy Grail in the Brasov Wrap Top: a wrap top with a modest neckline. I didn’t think it was possible, but look at how she did it. There’s so much to like in this top. The high back neck that smoothly transitions into the front neckline, pleats at the shoulders and side to create nicely draping folds across the bodice, and a curving hem line to reflect the feminine lines of the wrap and draping. The Brasov fits very comfortably, but I find myself fiddling with the crossover so it won’t lay too high across my chest. I’ll resolve this by lowering the front neckline just a bit next time. The Fabric: Tomato red cotton/lycra jersey from Simply by Ti. Ti’s cotton/lycra is a little heavier weight which I like for most of my sewing. 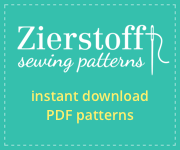 *I received the Brasov for free as a pattern tester. I have included Itch to Stitch affiliate links. Melissa this looks great on you. Love the color. Agree the neckline could go down a little. Looks soon comfy. This looks so cozy yet chic! I like how it’s a wrap top but you don’t have to worry about popping out everywhere. 😉 Great job! !